As a new mom, I've really had to learn how to multi-task and manage my time. I've always heard that I need to take care of myself in order to take care of those around me. 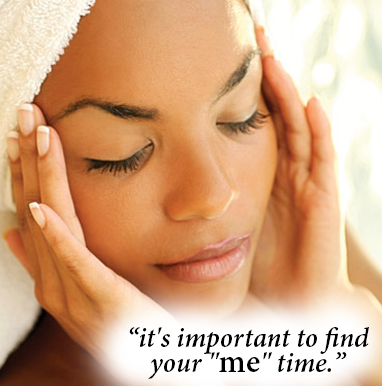 Whether you're a mom or not, it's important to find your "me" time. It's not always convenient to find this time for yourself, but all it takes is a few minutes to feel refreshed. Whether it's your morning coffee time, your 5 minute reading break or treating yourself to a mani pedi, try to clear your head and relax during your special time so you feel renewed and de-stressed. My "me" time is the occasional, wonderful hot shower. I shut the door, play a little music (while my hubby watches our son) and wash away the stress and spit-up of the week. Since I don't always get much time for myself, I need products that get the job done. I'm not too picky about my hair products at the moment, but I always love Phyto. These plant-based products are highly concentrated so you can use less. Your post-partum hair will probably lose the luster and fullness you got while pregnant. Luckily, Phyto has products for all hair concerns and over time, will visibly improve the health of your hair, making it possible to use less products to get the hair you want - all of this means saving money too! A little dry shampoo will also keep your hair looking fresh, add a little volume at the roots, and get you by until your next shower. I have always and will continue to recommend a Clarisonic cleansing brush to everyone! It takes just 60 seconds to take my skin from grubby to glowing. Pair it with the right cleanser for your skin and you're good to go. Get your customized Clarisonic consultation directly from our beauty experts and learn all of its amazing benefits. I'm not gonna lie, if I've got the time, I might just stand under the hot water to help ease aches and stress. Luxurious body products are also a sure treat and your skin will feel the benefits long after. I love the products from basq, bliss and Cuccio - great exfoliating and moisturizing products with invigorating scents. Whenever you get the chance, I hope you're able to treat yourself to some me time.